OWE - Mastiff or Bulldog? 'Mastiff', Abraham Hondius 1677. Compare to the OWE. The separation of OWE and WEB is the same as the separation of the Mastiff and the Bulldog. The White English breed is often called by various terms such as Old White English, English Whites, Old English White, White English Bulldog and most commonly by rural southerners, just plain bulldogs. 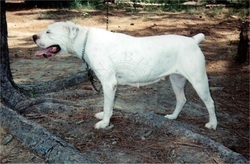 "White English" is the breed name, however there are two types within the breed; a mastiff type and a bulldog type. The mastiff type is known as the OWE and the bulldog type is known as the WEB. The mastiff type was known at one time as the White Farmer's Mastiff. Unfortunately not many people are aware of these differences or even that there are two types, mistakenly calling any and all White English as WEB. What confuses so many people is their understanding, or lack thereof, of the terms bulldog and mastiff. Despite the English Mastiff breed and English Bulldog breed being separated as their own distinct breeds in 1609, over 400 years ago, people still do not understand the difference, assuming that 'mastiff' means a 200+ lb. slobbering dog; and that 'bulldog' means any upturned nose, undershot, stubborn dog. These vast umbrellas of generalizations has destroyed people's concept of the actual mastiff and the actual bulldog. Historically and by definition, the mastiff has always been a guard dog of stock and family and a fighting dog of predator. The mastiff proper was never a hunting dog. Historically and by definition, the bulldog has always been a sporting dog. "The bulldog became defined by the sport it was used for..." Wynn. Today, these lines are blurred, leaving most little chance at understanding what either really is. "The word 'Mastiff' was dropped when describing these smaller Mastiffs, as the Mastiff Proper was found to be too slow for butcher's work and at a disadvantage when facing a bull." The Complete History of Fighting Dogs, Homan, 1881. This mention clarifies their separate function, size and name. As well, it clarifies how the mastiff type came to be blurred with the bulldog type, leading to the now common generalization of the many types of 'bulldogs', and the southern tradition of referring to any and all bull or mastiff types as simply, 'bulldog'. The OWE is a prime example. The OWE is the mastiff type White English. They are a mastiff proper (original mastiff type), in size, temperament and function, being used as guardians of the farm, which includes the property, livestock and family and were known at one time in England as the white farmer's mastiff. Suffice it to say, the white farmer’s mastiff was much more common in England than the estate guarding and war mastiff. They probably were related, but the white mastiff was from the Alaunt landrace and the other mastiff from the Molussus Complex. They are a much calmer, more relaxed, fairly quiet, seemingly benign yard dog until the time presents itself for them to prove just how ferocious and protective they are. They are not playful dogs, though they serve as playgrounds for the family's children, letting them wallow all over them yet rarely engaging in play themselves. Prey drive is very, very low in the mastiff type and as such they don't typically make good hunting dogs. There are physical differences as well: They have longer backs, longer muzzles, longer, flatter heads, less under-bite, and often have smaller feet. They are not the large, massive boned, heavily muscled, wrinkled, slobbering dogs that most associate with the mastiff, rather, they are of moderate size (50-95 lbs. +/-), far less mass and much more functional. The OWE does not do well in confined spaces and do not make good city or suburban dogs. They need plenty of space so that their inherent ability's can be best expressed. Oftentimes, with nothing to protect or no space to roam, the OWE will shut down. They may not eat, drink, get up, or even interact with their master. They must have a job to do. The ferocity of the OWE when engaged in protecting their charge is unlike any other breed I've ever encountered. There method of attack is far different than the WEB in that they approach from the rear and go for a fatal bite under the elbow and into the chest of a predator, be it man or beast; sometimes they may go for the throat. Either way, when they respond to a threat, they respond with the intent of permanently doing away with it so that it never returns. They are extremely serious dogs that do not belong in the hands of the novice. Below is the typical bite and large canines of the Carr White English. 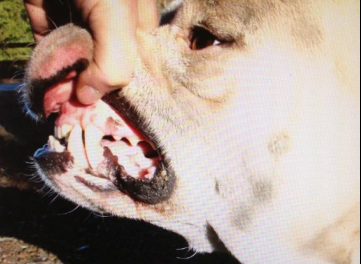 The Brindle Bulldog has this same bite. 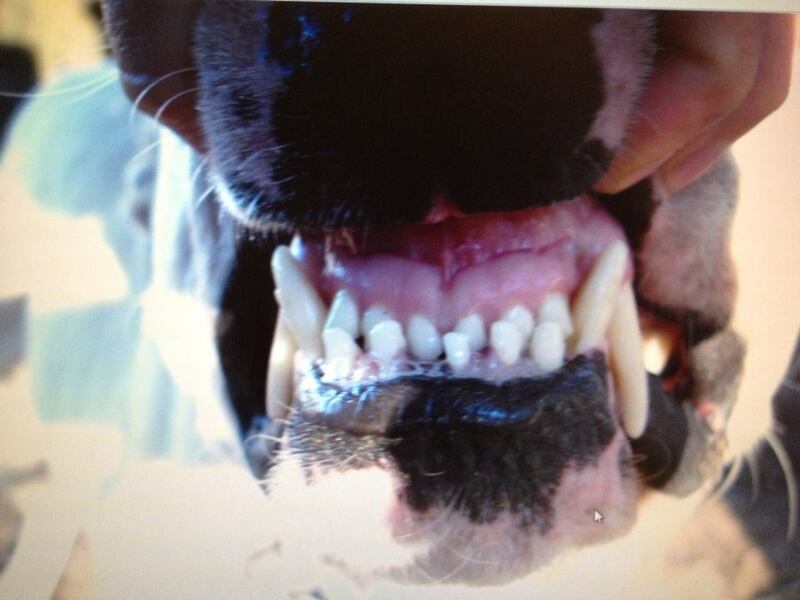 Typical canines and bite of the CWE. The bulldog type, or WEB is a much different than the mastiff type OWE in a number of ways. Most noticeable is the temperament of the WEB when compared to that of the OWE. The WEB is a much more active and playful dog with a higher prey drive, making them more suited for hunting and less suited for guarding livestock, especially fowl. They are more vocal and enjoy the attention and praise of their masters more so than the OWE. Physically they are shorter in the back, have shorter muzzles, shorter, more square, (Mesocephalic), heads; more of an under bite, more wrinkle and lip and often have very large, rather flat feet. They do fairly well in smaller spaces and adjust to city life well. They are content being a family pet, playing with the children and toys but do need to stay active or can become destructive. 1850 Bulldog. Compare to the WEB. The WEB, unlike the AB, has no outcrosses to various breeds that were added first by Johnson and then by others for size, color and for hunting. They are as close to the original English Butcher's dogs of any to be found. They do exceptional work in herding a variety of livestock, including all sorts of fowl. They are a much more versatile dog than is the OWE whose primary function is as a guardian of the home, stock and family, in following with the traditional role of the mastiff proper. 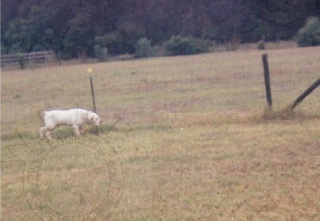 These white mastiffs continue serving as farm dogs throughout America's deep south. A courageous protector of livestock, including cattle, swine, fowl, and family; they are prized for their innate abilities and intelligence and highly respected for their ferocious guarding instincts. Despite being generalized with and called bulldog in the US, we see that that the OWE is infact the mastiff proper; it remains the same basic Alaunt type. The Alaunt/Mastiff type is simply defined as the original Alaunt type, Canis Alani, used with large herds and to kill wolves and bears in defense of them, and being the same as the mastiff. "By the same custom Alani gives an Alan, or in a secondary sense a cattle dog or mastiff, employed as a guard against the wolf." The History of the Mastiff by: M. B. Wynn 1886. The Beisser/Bulldog type is defined as the true holding and pinning dogs first developed in Germany for the use of sporting noblemen on the hunt and later in Western Europe for the blood sport of bull-baiting. Their use as a hunting dog by sporting nobleman classifies the Beissers as a sporting and hunting dog. The bulldog, by definition, has always been a sporting dog used by sportsmen in the blood sports of the baiting ring. The Beisser type was first recorded in history in Germany in the 5th Century AD. "In Germanic law from the fifth and seventh centuries AD, these Hunting Dogs were recorded in writing for the first time." Dr. Dieter Fleig. The bulldog did not exist, (by name or the sport it was used for), until after the Elizabethan era. It was first recorded by name in 1609 in England. "The term Mastiff until after the age of Elizabeth was used for both mastiff and bulldog, being applied merely to denote a house or watch dog. ... The bulldog became defined by the sport it was used for..." Wynn 1888. "The tractability that had so characterized the white farmer’s mastiff went out the door." Just as was done 400 years ago, the bulldog was separated from the mastiff, yet today the division between the two have blurred. This is why we are showing the clear distinction between the OWE and the WEB, once again separating the two; the mastiff and the bulldog. The moniker 'bulldog' is commonly used to describe fighting dogs, so much so that to say 'bulldog' often implies a fighting dog. The term is even applied to other types of dogs besides actual bulldogs simply because of their history as a fighting dog. The OWE is a prime example, as is the BB, a dog much closer in type to the indigenous dogs of the islands of the Mediterranean and the Canaries. Their superior fighting abilities have earned them the erroneous moniker of 'bulldog', much like the WE, which are in fact rustic mastiffs. To explain this misnomer, we turn to Spain and their long history of bull-fighting and their notorious fighting dogs of the arena and of their Conquests. Since the importation of bull fighting/war dogs by Spain was the first major importation of fighting dogs into the Americas, we can surmise that this gave us the name 'bulldog' to describe any fighting dog, regardless of it's breeding.